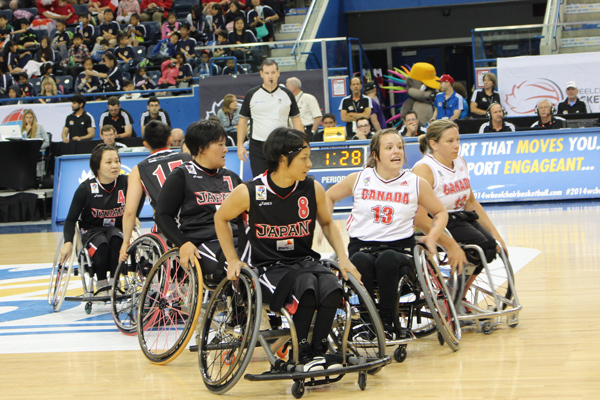 With the sound of the buzzer signifying tip off, Japan and Canada’s national wheelchair basketball teams squared off. And for people who have never seen wheelchair basketball before, they learned one thing. Wheelchair basketball isn’t just a game, it’s a way of life. “It’s probably a once in a lifetime opportunity for the athletes and the fans,” Joe Higgins, one of the coaches of Canada’s national wheelchair basketball team, said in an interview with Nikkei Voice. 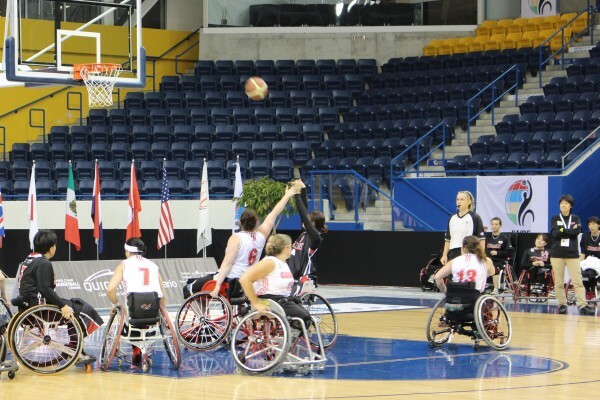 The 2014 Women’s Wheelchair Basketball Championship saw over 12 countries represented in a fan filled Mattamy Athletic Centre, making history, as this was the first time the women’s championship would be played separately from the men’s event. “It’s hard to explain how much it means,” Janet McLachlan, one of team Canada’s star players said, speaking to the difference wheelchair basketball has made in her life. McLachlan’s played on both Canada’s national basketball and rugby team before suffering a devastating knee injury that could have easily been a career ender. “I bent it 90 degrees, sideways,” she said. One of her teammates at the time introduced her to wheelchair basketball and she hasn’t looked back since, playing on the Canadian national team and a semi-professional team in Germany. “Not a lot is different, the comradery, the team atmosphere, it’s the same. I wouldn’t want to do anything else,” she said. As the game begun, McLachlan, won the tip off and within seconds, her teammate Katie Harnock wheeled her way into scoring the games opening layup. Japan’s Megumi Mashiko would storm back to score a layup right back. 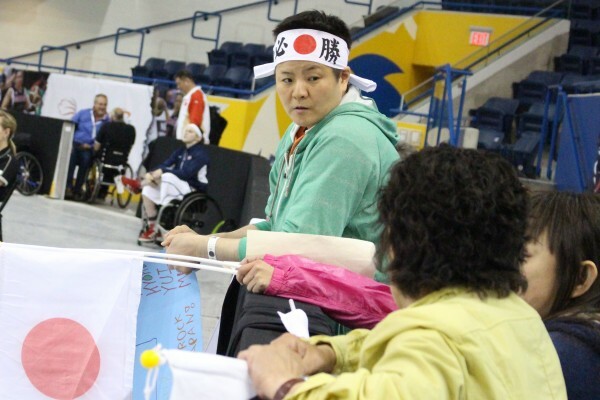 As the teams played, fans cheered for both the Canadian and Japanese team, but Chika Uemura, who owns the record for the most games played at the Paralympics for team Japan, waved her home team’s flag. During her tenure as captain of team Japan, she won an Olympic bronze medal at the 2000 Sydney games. Uemura has played at the highest level possible even with a spinal cord injury that still allows her to stand, but doesn’t allow much mobility while upright. She has lived in Canada for 34 years now and she would be representing Japan in this year’s championship if it wasn’t for her severe asthma. 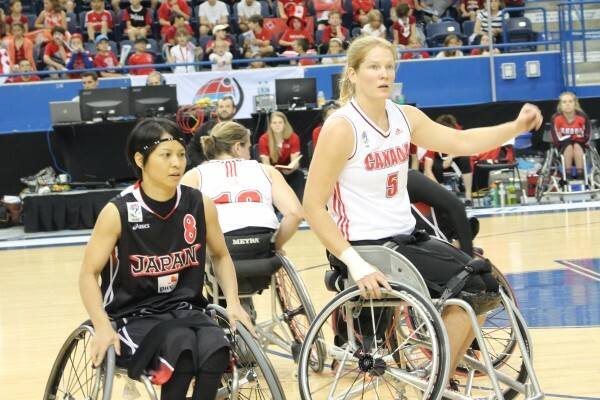 Despite being out of the action this year, Uemura hopes she’ll be able to compete next year representing Japan and is thankful for everything wheelchair basketball has done for her. “It’s my life, its given me everything, friends – best friends,” she said. After only a few minutes of watching wheelchair basketball, you can see just how intense the games can get. Hard screens are set, cutting opponents off to create an open lane for teammates. While sitting, players rush down the court after a change in possession; they hustle down the floor and aggressively pivot trying to break away from their defenders, looking for the ball. Defenders hound and double team the offense yelling, “ball, ball, ball, ball!” Trying to intimidate the opponent into turning the ball over. The player’s shoot with elegance, perfect form, and precision. But the one difference that was incredibly apparent was the sportsmanship that the wheelchair basketball players displayed. While the game was played, Japan and Canada were duking it out. Gritty cuts by the offense met the clank of the defenders’ wheelchair blocking their path. But whenever a player fell, often with their wheelchair on top of them, the “opponent” would hold her arm out and help her up, regardless of the jersey she wore. Higgins, who has been involved in wheelchair basketball for over 40 years said, that the great distinction between wheelchair basketball and other sports is the fellowship of the athletes. “They compete hard, but at the end of the day, they’re all brothers and sisters. They help each other up,” he said. Megumi Mashiko, a native of Fukushima, Japan also sees the game as a very special tool that can be used for good. “Humanity can be polished through playing basketball,” she said.